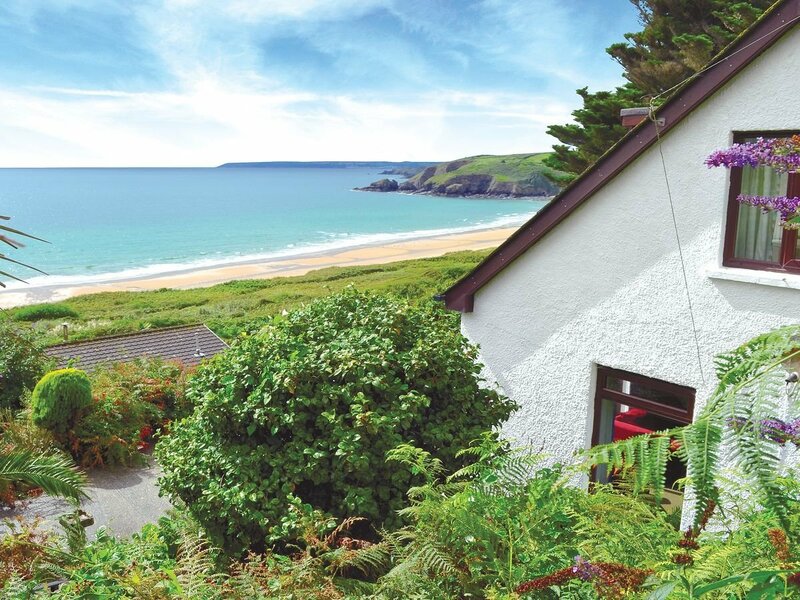 This spacious detached end of road holiday property provides breathtaking views across the mile long south west facing golden sands of Praa Sands and out to Mount Bay. The large flat patio area is ideal for relaxing after an enjoyable day. Up a steep slope, the smaller upper patio has further breathtaking views. Access to the beautiful sandy beach with surf school and summer lifeguard patrol, and the scenic coastal pathway is down a small path a few yards away. This is truly a wonderful location for a great family holiday whatever the time of year. From this central location a short drive will take you to the golf course, Flambards at Helston, sailing at Newlyn and restaurants in Porthleven. Cornwall’s oldest charter town of Marazion overlooks the 12th century St Michael’s Mount (NT) accessed by a romantic causeway walk at low tide. Travelling on further south one will enter another world, the beautiful Lizard Peninsula. Almost untouched, it is flush with rare wild flowers, unspoilt fishing villages and sheltered beaches. It is home to the massive serpentine stacks of Kynance Cove and caves at low tide and the secret location of the real Frenchman’s Creek. The Lizard village offers craft shops, art galleries, cafes and inns clustered around the village green. A walk to the lighthouse, lifeboat station and mainland Britain’s most southerly point is a must. Also close by is the ancient coinage town of Helston famous for its Furry Dance held in May each year. Shops and pub 1/4 mile.4 steps to entrance. Living room: With open fire, TV, DVD player, CD player and patio doors leading to patio. Kitchen: With electric cooker, microwave, fridge, freezer, dishwasher, washing machine and tumble dryer. Bedroom 3: With twin beds and en-suite with shower cubicle and toilet.Night storage heaters, electricity, bed linen and towels included. Initial fuel for open fire included. Cot and highchair. Terrace garden with patio area, garden furniture and BBQ. Private parking for 3 cars. No smoking. Please note: The garden has steep slopes. Be the first one to tell us about your rental experience while staying at Suncroft. Let us know if the listing matched your expectations. You can share your comments about the location, property owner/manager and all the unique features that made your stay a memorable one.